Thank you, I'm so happy you think so! I'm glad you liked my choice for that name and I'm curious about your history with Deth. 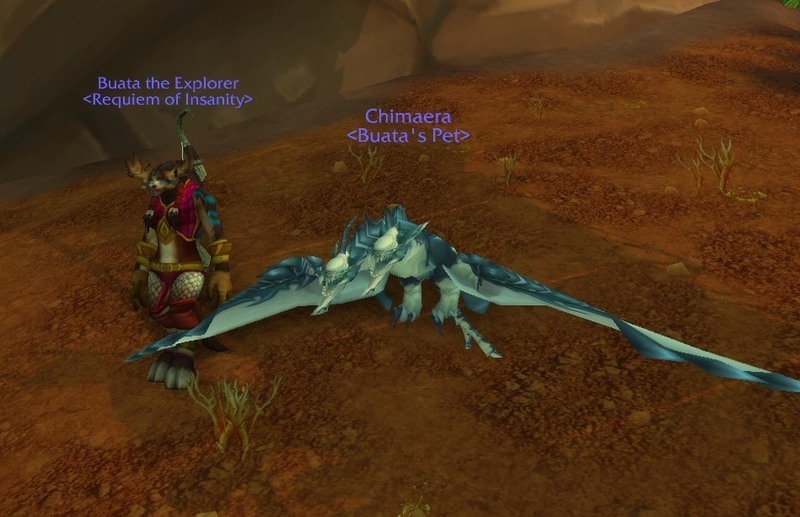 I'm also looking forward to reading about Korvina's future tames and I really like how both her mount and Umbra stand out in your screenshot! Things will be slowing down a fair bit for Lunaire as I plan on enjoying Pandaria rather than blazing through it like I did with getting from 60 to 80. She also has no planned tames in Draenor and all her Legion planned tames are max level only. Edit: Lunaire's now level 90, but I'm staying in Pandaria till she's 91. I went and grabbed one of her planned tames, a lake strider who I named Pélagique (deep sea). 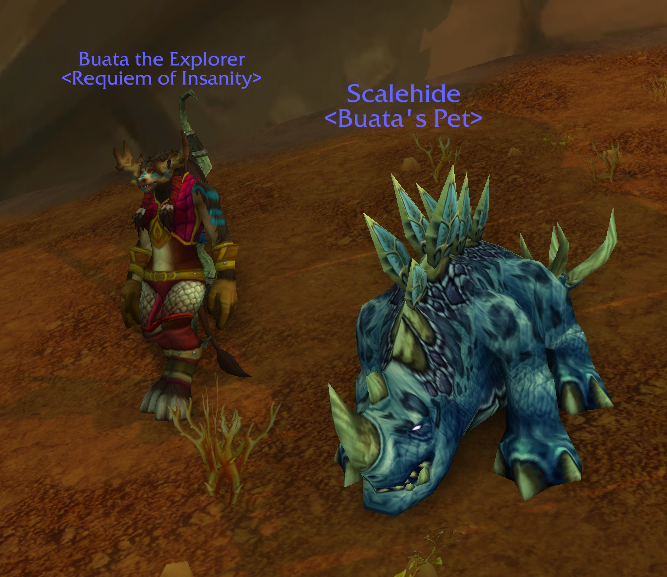 I greatly prefer the plated striders over the standard ones personally, and am happy that a blue one exists to match the mount. Unlike Lunaire's other pets, who all have made their genders known to me, Pélagique is a mystery to me, even after running around with them for a few hours last night after taming. In the water area of the Temple of the Jade Serpent (non-instanced version). Last edited by Kya on Mon Apr 16, 2018 10:24 am, edited 1 time in total. Nice! 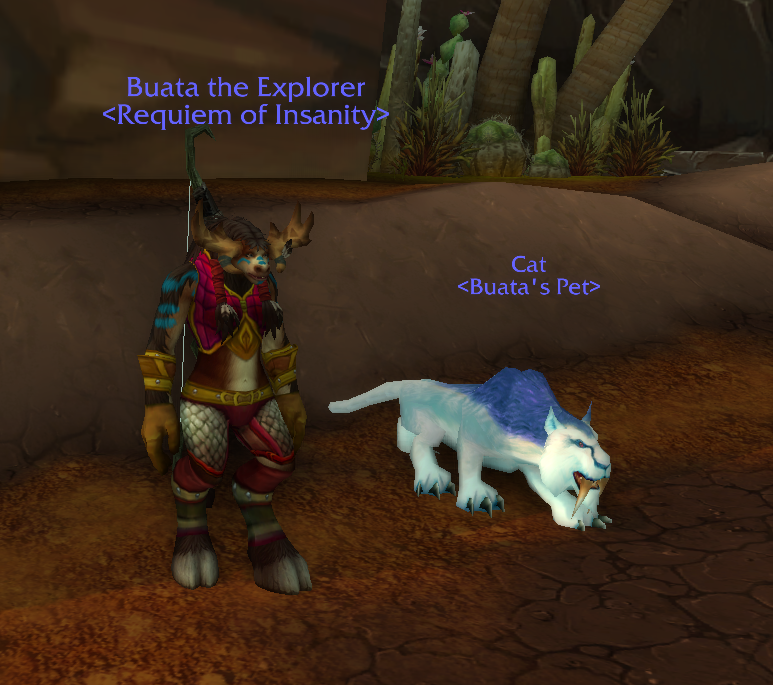 I only have her on one other hunter, and that time, I tamed her via the druid roots method thanks to my best friend, who sadly doesn't play anymore. 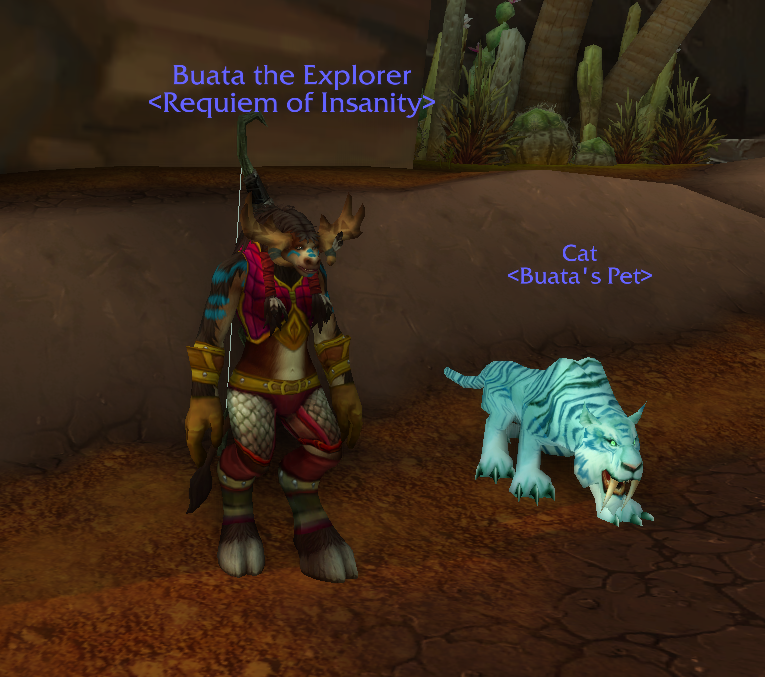 You're welcome, the void elf moun and hunter starter pet go really well together. And he was still floating when we landed, but a dismiss and resummon fixed it. "Lunaire, stop this crazy thing!" Lunaire just stands there, too dumbstruck to do anything. That aside, last night, I asked my boyfriend to help keep aggro control on the Isle of Giants so Lunaire could tame a ladyfriend for Destin. Brume (mist), is way more quiet than Destin, but she's extremely stubborn and won't listen to a word Lunaire says. Good thing she has Cadeau and Destin to keep Brume reined in while she's still wild. I had to dismiss and resummon her in order to get her positioned on the planter and again in order to get her off there because she would not follow me no matter how many times I pressed the command. 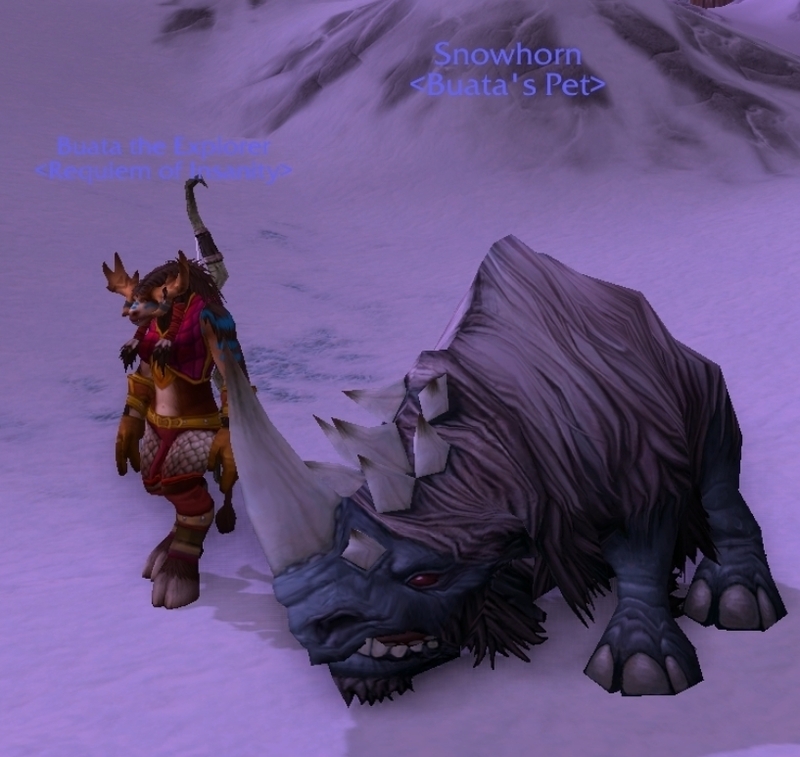 A dinomancy tome happened to drop for Lunaire off the first group of dinomancers my boyfriend helped me kill, so I was able to tame a blue direhorn as a bonus. Meet Bourrasque (squall), a clingy sweetheart whose glued himself to Lunaire like a bee to honey and who's the complete opposite of Brume. 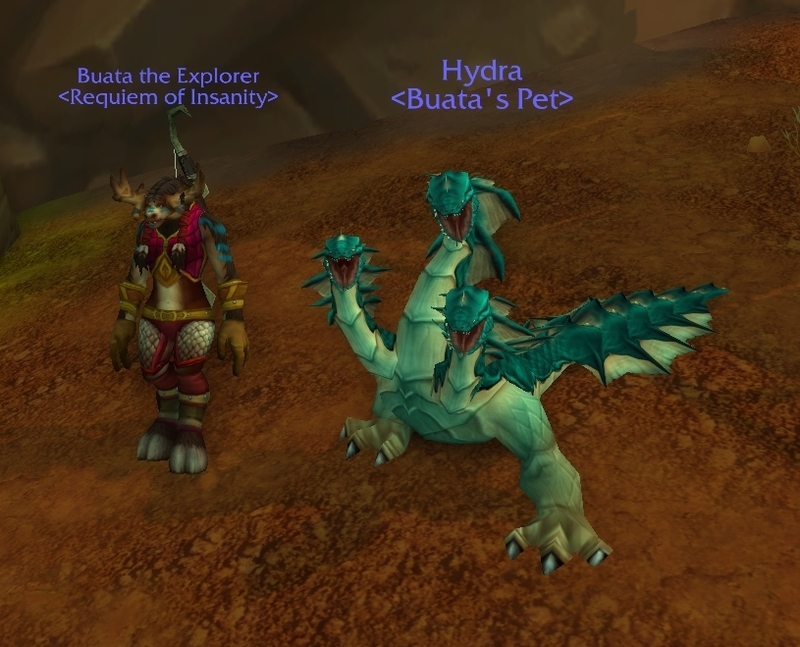 Funnily enough, he was the one who immediately aggroed when I went closer to the group while deciding on which to tame. Believe it or not, he got up there by himself. As for Korvina, she's being slowly levelled between me farming Arakkoa Outcast rep for her intended title, but she did make a new friend. 's okay and it definitely is, way less of a repair bill to worry about. XD Cadeau's had other excursions aside from his strange outing in the Jade Forest, I never really caught any screenshots of him when Lunaire had him out, but he's seen his fair share of Outland and Northrend. Thankfully the flying seems to be only a one time thing, hehe. 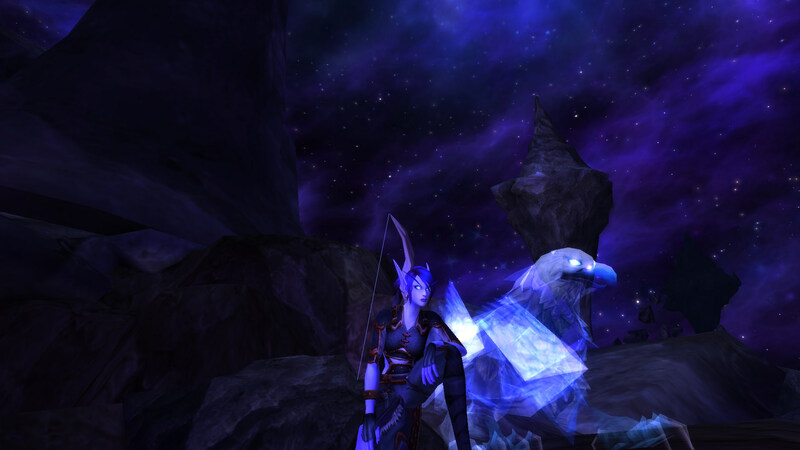 The spectral griffin looks really nice with Korvina, especially with the starry background. 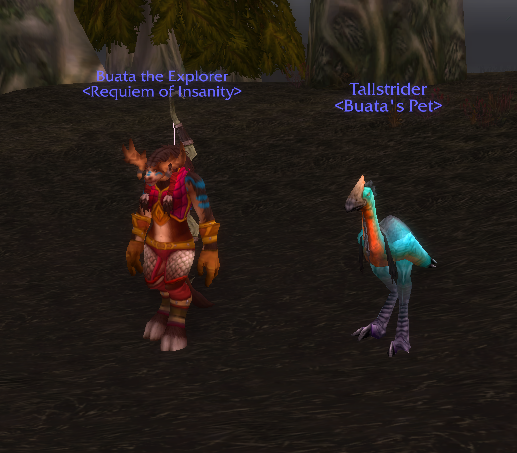 And I think it fits in well with a kaliri and raptor theme, given the avian traits. And you're working on getting the Talon Queen title for her? Interesting and I'm a bit curious why you want it for her. As for moving Zar and Aruk to her from Vyonne, if it feels right to do it, I say go for it. Lunaire's now at 95, and Couvrir (to shield) is her last tame for a while. My boyfriend helped me with the Crypt of the Forgotten Kings scenario to get this lovely girl, and I'm so glad it can be done with only two people so no worry of a random jerk killing both quilens on me. Despite her stern appearance, Couvrir is pretty glad to be out of that dark, stuffy crypt. She moves about like a bouncy, happy puppy when she's not busy tearing off limbs. Also, absolutely loving Couvrir! She's definitely a fierce looking girly and her name is perfect for her. I do love the quilen's facial expression as well, they look like they're constantly mildly displeased about something. You're welcome! It really does, I quite like the detached feel the void elf starting area gives, from what I've seen of it in pictures, anyway. 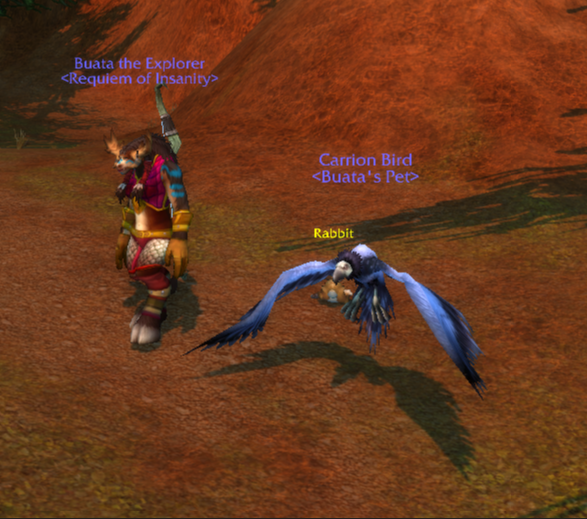 I'm curious about how Korvina will interact with the Outcasts, and do you have a favorite arakkoa NPC? And the way she's dressed is quite similar to my rogue, Lynxfang! 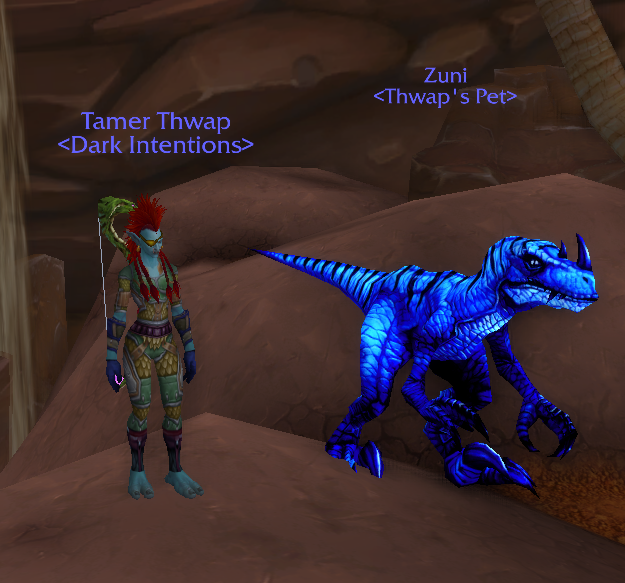 That, and Lynx was my main for Warlords, and she also became closely involved with the arakkoa as a whole, Terokk especially because he's awesome. Weaponss mogged to ninja swords because the default appearance for the subtlety artifact daggers are UGLY. Thank you, I'm so happy you like her! Oh, they are, and PetEmote even gave them an emote that I really liked back when I used to use that mod: Quilen looks at <target> disdainfully. And her starter pet, Étoile (star) who, unlike Lunaire's Ciel, is rather derpy. 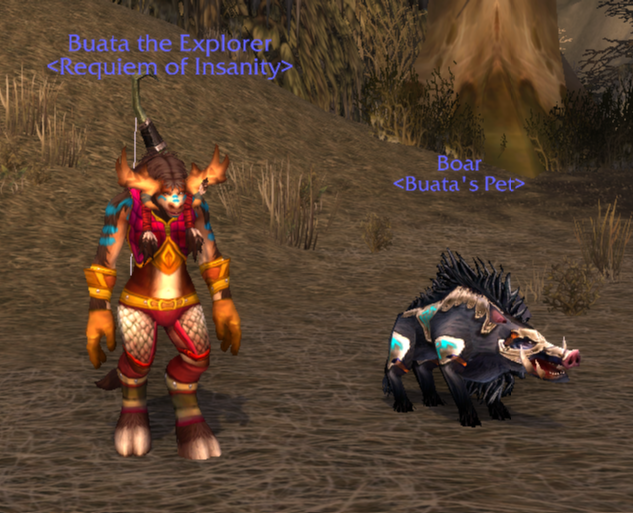 I may or may not tame anything else before Pandaria on Sidérella, but we'll see. 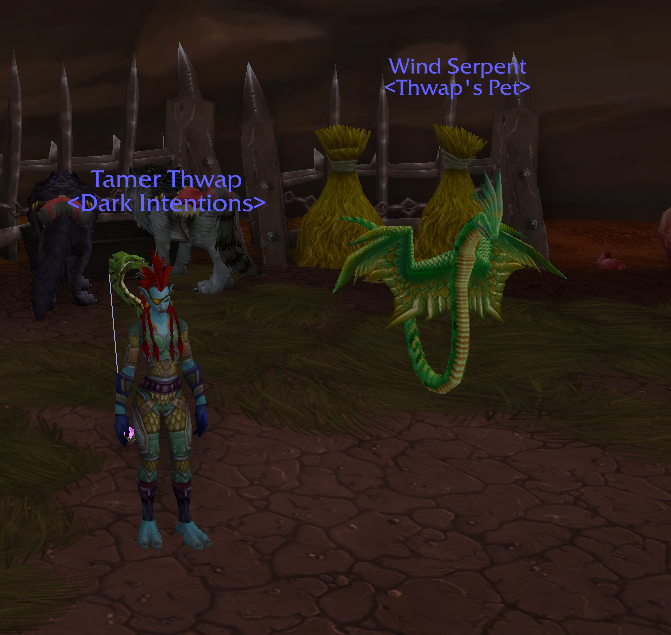 I went on a massive taming spree for my birthday yesterday. 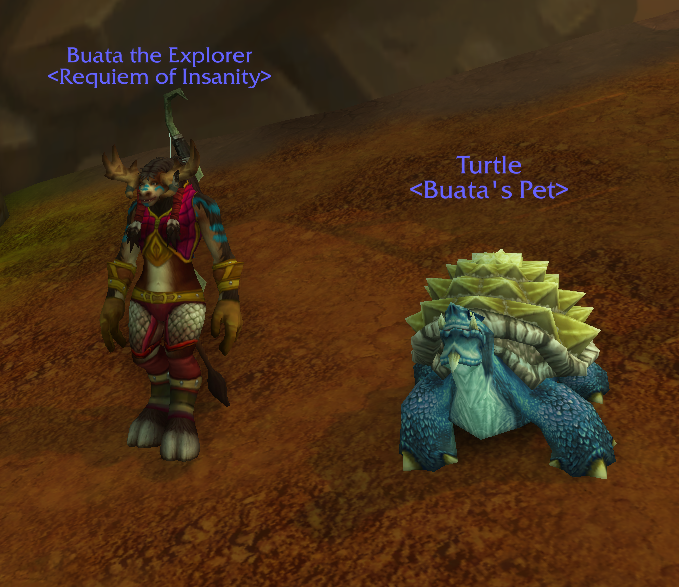 x3 Buata hit 40 and got a ton of new friends! 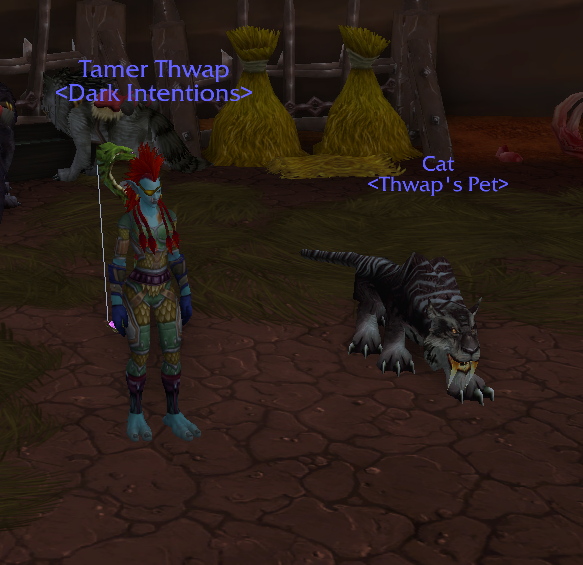 One of my Trolls named Thwap (First toon I ever made! She'll be 8yrs old soon!) tamed a few too! ALL THE BLUE for the Moomoose! I'm wanting to name them some Taruen-esc names, I just gotta think about them for a little while. There's a mix of rares and commons among the group there! I did a 'Throw it and see what sticks' deal with these. We'll end up seeing which ones stay in the end. Necroing this thread because I'm not comfortable with making a pet journal. I'm so sorry! I unlocked void elves a couple of days ago, and I plan on leveling one to see how high I can get her before Zandalari finally become playable. So, say hello to Kemurikage who will be my Alliance-side forever main when I get her to max level. She only has two pets as of right now, first up being her starting companion, Yuya (a thousand nights), who's a bit of a dork as she raised him from a baby and kind of maybe slightly spoiled him. "Mama, WHY do we have to go near this thing?! Pleasepleasemakeitstop!" ...unless it's from the Deeprun Tram, which I swear he's absolutely petrified of, because every single time I've gone on it with him out, he tries to cling to her legs and I'm surprised he hasn't outright bowled her over yet in desperation to keep away from the loud scary thing. (Edit: Her wasp is now named Ayame (iris flower). She's my second favorite boss wasp skin next to Huhuran/Cida and I felt she fits a void elf pretty well given her colors in spite of them being rather vibrant. Last edited by Kya on Thu Oct 25, 2018 7:42 am, edited 1 time in total. Ahh, look at lil' Yuya! He looks so very proud of his mama in one screenshot, I love it~ Volux also makes a very nice addition to 'Kage's stables - she's got that purple look down to a T and it's beautiful! Hehe, thank you! That's my absolute favorite screenshot of the bunch I took of them. 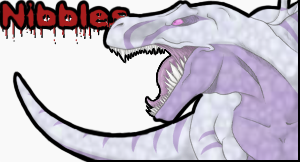 And Volux finally has a name, as I've decided to go with a Japanese theme for her pets. 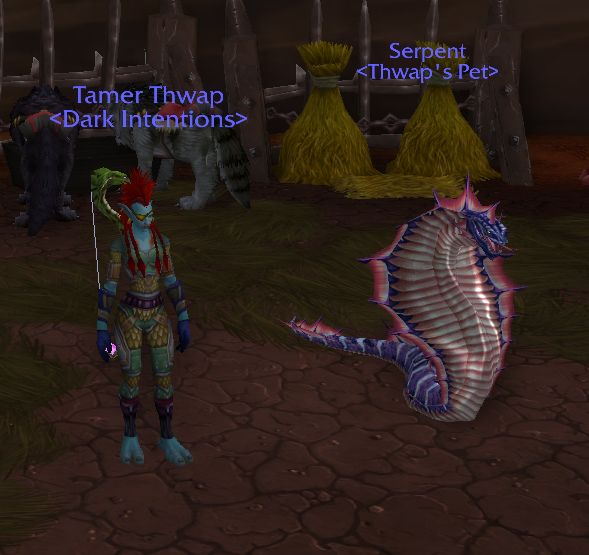 Still, I don't have any other low level tames planned for her right now, so posting will probably be few and far between until she hits the higher levels.